Pasadena City Hall is located at 117 East Colorado Boulevard, Pasadena CA 91005; phone: 626-744-4124. Photo: Longfellow-Hastings Octagon House, ca. 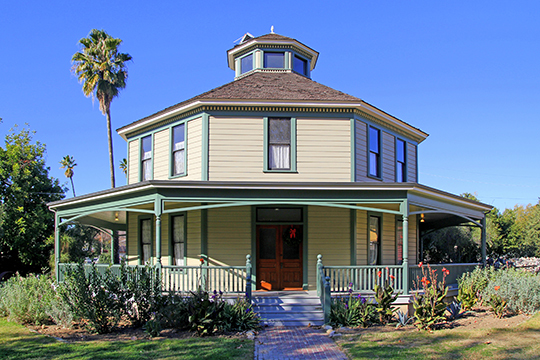 1893, 85 S. Allen Avenue, Pasadena, CA. Listed on the National Register of Historic Places in 1982. Photographed by User:Sgerbic (own work), 2011, [cc-by-3.0 (creativecommons.org/licenses/by/3.0)], via Wikimedia Commons, accessed May, 2014. Many of these travelers found themselves in Pasadena, as its proximity to the railroad lines made it a natural destination for both seasonal tourists and permanent settlers alike. By the 1880s the community had changed from a small town to a thriving resort. The Tournament of Roses celebration, envisioned by early civic leaders as an opportunity to promote tourism and the warm winter climate, drew thousands of visitors to the West Coast. The tradition started in 1890 and evolved over time to include various activities, including the first football game in 1902. By 1920, the game had gained such prestige that organizers knew they needed a permanent home, and settled on a City-owned site in the Arroyo Seco for their new stadium, the Rose Bowl. In addition to the seasonal tourists, the permanent population grew exponentially during this period as well. The proliferation of local rail and electric trolley lines by moguls such as Henry Huntington enabled people to settle away from the urban centers and attain the American dream of a small house and a garden to call their own. As Pasadena's population expanded, so did the commercial district along Fair Oaks Avenue and Colorado Boulevard. The heart of this bustling commercial center is known today as the Old Pasadena Historic District, and is listed on the National Register of Historic Places. The earliest residences in Pasadena were simple board and batten structures or unadorned farm houses like those the Midwestern settlers had left behind. As Pasadena grew and turned from agriculture to commerce, area merchants began building more sophisticated residences, boasting fancy detailing and more complicated floor plans. In the late 1880s, mansions for prominent Pasadena citizens started to dominate the landscape. By the turn of the 20th century, South Orange Grove Boulevard had been dubbed "Millionaires' Row" for its abundance of grand residences lining the street. While many of these mansions were designed by prominent architects working in the city, most Victorian-era homes were built by contractors utilizing catalogues for design ideas and mass produced architectural details. See: Single-Family Residential Architecture of the Arts and Crafts Period in Pasadena, 1895-1918. For City of Pasadena by Historic Resources Group and Pasadena Heritage, Cultural Resources of the Recent Past Historic Context Report, 2007, Pasadena CA.